Stewart Newlands leaving Elgin Sheriff Court. A Moray man who threw a mountain bike at police before spitting and threatening to kill them has been jailed. 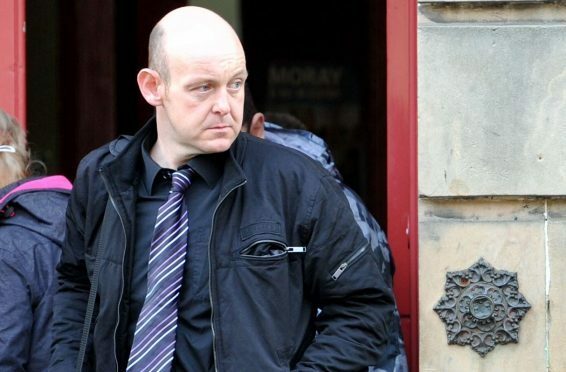 Officers were called after Stewart Newlands, from Forres, started banging on the door of a woman he only knew from social media and had never met. Yesterday, the 37-year-old was jailed at Elgin Sheriff Court after he pleaded guilty to a string of offences including two charges of assaulting police officers. Sheriff Olga Pasportnikov described the ordeal of having the man appear uninvited at the Forres home as a “frightening incident” for the woman – while labelling Newlands’ later behaviour with police as “abominable”. Fiscal depute Rowena Carlton told the court Newlands started knocking on the St Ronans Road door at about 10pm on February 7 while declaring his desire to begin a relationship with the woman he knew only from online. After being asked to leave he started to “bang loudly” on the door which led to police being called to the scene. Miss Carlton said: “Officers found the accused to be near the house. He told the police to go away before picking up an adult-sized mountain bike, raising it above his head and throwing it at both constables – striking one of them. Despite warnings about his behaviour Newlands then spat at the police, which “narrowly” missed the face of one officer. A later search of him found £10 worth of cannabis resin. Defence solicitor Stephen Carty explained his client’s behaviour had improved since his last conviction in May 2017 – when he stole a charity tin from a garage. Newlands, of Grant Drive in Forres, was sentenced to 80 days in prison after admitting two charges of behaving in a threatening or abusive manner, two charges of assaulting police officers and one charge of possessing a class B drug.